In 2003 the story of Li Cunxin’s remarkable journey from a village in Shandong province in rural China to the world stage was published as Mao’s last dancer. The story was subsequently made into a film and then written as a children’s book, The Peasant Prince. Now it has become a theatre work for children presented, astonishingly, by a cast of just four from Monkey Baa Theatre Company. The show begins with John Gomes Goodway, who plays Li, standing on stage waiting for the curtain to go up on his performance as the Nutcracker Prince in a Houston Ballet production of Nutcracker (and of course Li, now artistic director of Queensland Ballet, made his debut outside of China with Houston Ballet). 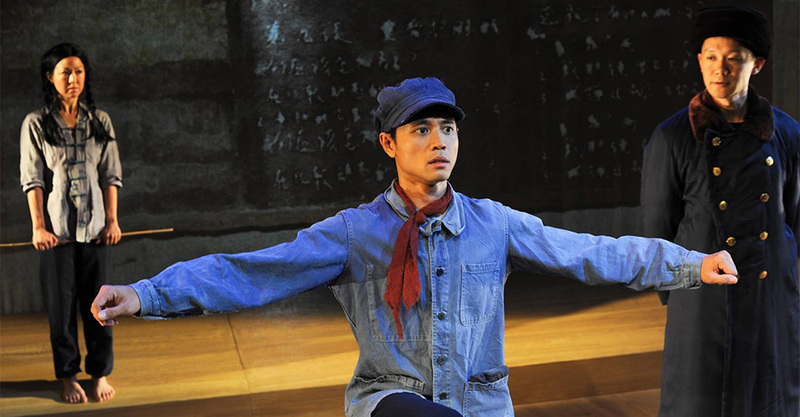 It then flashes back to his childhood, his selection by an official sent by Madame Mao to join a dance academy in Beijing, his training, his homesickness, his determination to keep moving forward, his eventual invitation to visit Houston Ballet for a residency, and finally his decision to remain in the West. It returns in the closing scene to the opening and the moment when Li, watched by his parents, takes the stage in Nutcracker. From a dance perspective, the choreography by Danielle Micich (called ‘Movement Director’ on the printed program), is beautifully conceived for a young audience. My almost-six-year old companion could recognise some of the ballet movements she is taught in her beginners’ class, for example. But it is also developed enough for an older audience to enjoy, especially for the way in which an exercise barre is used to indicate the passing of time, and for the expertise of the cast who move from one character to another with apparent ease. I’m not sure how much of the political context (necessary for the unfolding of the story of course)—that is the constant praise of Chairman Mao and his policies along with the critical comments about America—was understood by younger children. And the scene where officials from the Chinese Embassy in the US tried to make sure that Li did not stay in the West was rough and a little scary for some. Some explanation beforehand by parents/grandparents is probably necessary if their charges have not read the book. But in essence The Peasant Prince was an engaging show, beautifully staged with minimum fuss.